Used to join together a PVCc pipe and a threaded fitting together. The plain end of the fitting should be fixed to the pipe using PVCc solvent cement along with PVCc Eco-Cleaner. 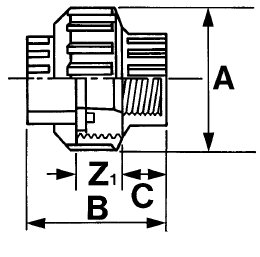 The threaded end will connect to a standard bsp threaded fitting. DP PVCc Union Plain / BSP Threaded EPDM 16mm x 3/8"
DP PVCc Union Plain / BSP Threaded EPDM 20mm x 1/2"
DP PVCc Union Plain / BSP Threaded EPDM 25mm x 3/4"
DP PVCc Union Plain / BSP Threaded EPDM 32mm x 1"
DP PVCc Union Plain / BSP Threaded EPDM 40mm x 1 1/4"
DP PVCc Union Plain / BSP Threaded EPDM 50mm x 1 1/2"
DP PVCc Union Plain / BSP Threaded EPDM 63mm x 2"